Esther Stinson has been a part of Central Ohio Community Theatre since 2007. 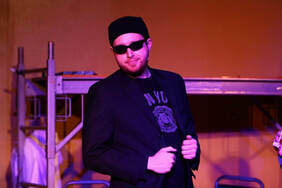 A regular actor in the chorus for Center Stage Players shows such as Footloose (2008), Mame (2008), Sweet Charity (2009), RENT (2011) and The Rocky Horror Show for 5 years straight. Esther was a founding board member of Imagine, serving as the first board Vice-President and later President. While on the board, Esther has also served on production teams, including stage managing Imagine's inaugural show The Wedding Singer and assistant directing Spring Awakening. She works at BJ's Brewhouse and is pleased to once again be a part of Imagine leadership. Ed Eblin is no stranger to local community theatre in Central Ohio. Ed is one of the founders of Imagine Productions, where he initially served as President of the board and is currently in the role of Treasurer. Prior to his affiliation with Imagine, Ed was a board member and the Artistic Director for Center Stage Players from 2003 through 2010. He has been affiliated with numerous productions as an actor, director, stage manager, and in other technical capacities. When he is not busy with his theatre hobby, he is a high school math teacher at Eastland Career Center in Groveport. He also is an adjunct instructor for Columbus State Community College. He resides in the Short North with his partner, Ryan, and their two dogs Jack and Haley. 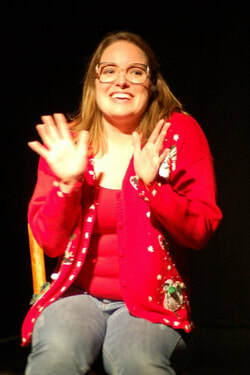 ​Corrine Buuck has been doing theater since middle school and has been part of the community theater since 2014. Corrine is a proud graduate at New Albany High School, The Eastland Performing Arts Program, and The Ohio Media School. Some shows she has done with Imagine include Rocky Horror Picture Show (Chorus), Jesus Christ Superstar (Apostle), The Best Little Whorehouse in Texas (Beatrice), and Avenue Q (Chorus). Some other shows she has done outside of Imagine include Hairspray (Gym Teacher/Chorus), Little Shop of Horrors (Chorus/Puppeteer), and Leaving Iowa (Mrs. Johnson/Jamie). Outside performing, she is a meteorologist for WZMO radio in Marion and is an actor at Great Room Escape. She also loves to make videos and loves to spend time with her friends and family. Corrine has a wonderful boyfriend name Douglas (who you can also see act on stage sometimes) and has a crazy dog name Daisy.